July 10, 1212 – The most severe of several early fires of London burns most of the city to the ground. July 16, 1212 – Battle of Las Navas de Tolosa: after Pope Innocent III calls European knights to a crusade, forces of Kings Alfonso VIII of Castile, Sancho VII of Navarre, Pedro II of Aragon and Afonso II of Portugal defeat those of the Berber Muslim leader Almohad, thus marking a significant turning point in the Reconquista and in the medieval history of Spain. September 26, 1212 – Golden Bull of Sicily is certified as an hereditary royal title in Bohemia for the Přemyslid dynasty. 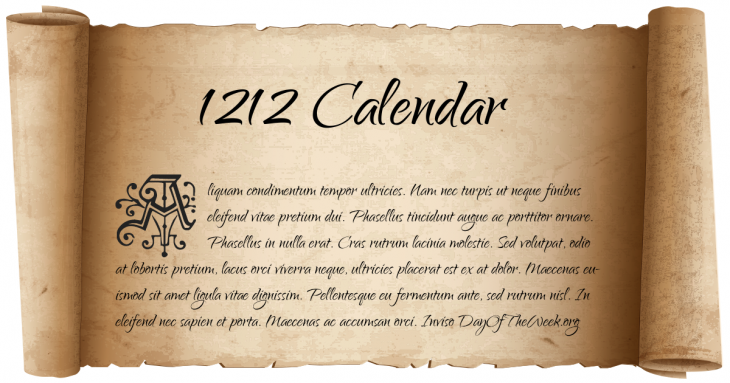 Who Was Born On 1212?